(CNN) -- The fourth typhoon to hit the Philippines in a month came ashore east of the capital, Manila, on Saturday morning, bringing heavy rain, flooding, and washing away shanty houses near the coast. Typhoon Mirinae quickly moved west into the South China Sea and became a tropical storm. It was forecast to continue due west and then take a slight turn south, hitting Vietnam in about 48 hours, according to the Joint Typhoon Warning Center. There were power flashes across Manila, as the storm hit Saturday and cut the electricity supply, videographer James Reynolds said. The storm was weaker than expected, he said, but it still brought fierce winds and lots of rain. "The wind and the rain and the floods have still caused quite a considerable amount of damage, certainly in the southeastern portion of the city, which is where we were," Reynolds told CNN by phone from Manila. "We saw many shanty-type houses that had been washed away and residents frantically try to get hold of their household material." The storm dropped at least 85 millimeters (3.3 inches) of rain on Manila. 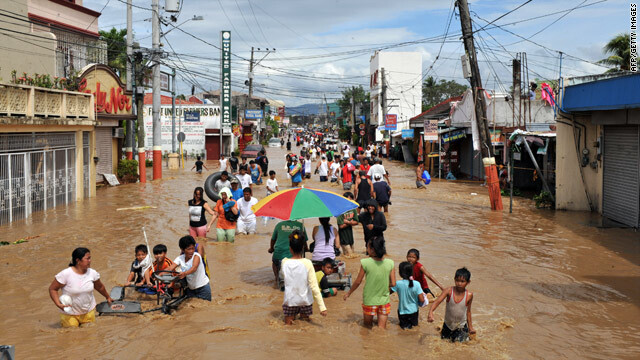 The city of Daet, on the eastern coast, received 149 millimeters (5.8 inches) of rain, and Virac, which sits on an island that juts into the Pacific, received 72 millimeters (2.8 inches) of rain. The first of the four typhoons to batter the Philippines happened in late September, when Ketsana drenched the island nation with its heaviest rainfall in 40 years. 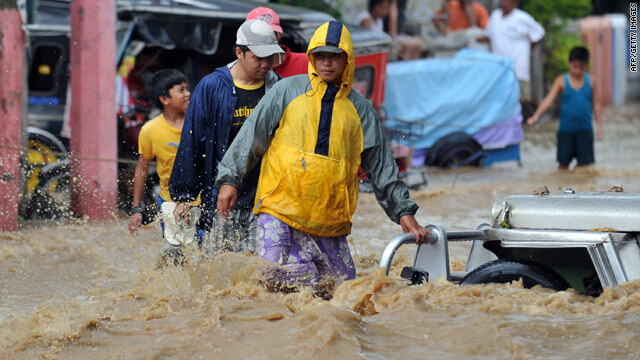 Eighty percent of Manila flooded and more than 420 people died. Flooding from Ketsana has lasted well into October, and tens of thousands of people are still in evacuation centers, according to the disaster coordinating council. On October 3, Typhoon Parma made landfall in a rural region of fishermen and farmers in Luzon, the largest of the Philippine islands. It destroyed 55,000 houses and killed more than 430 people. Last week a third typhoon, Lupit, narrowly missed making landfall but still brought lots of rain to the Philippines.